Service mesh. Host shared proxy. Sidecar containers. If these terms are unfamiliar, don’t worry. 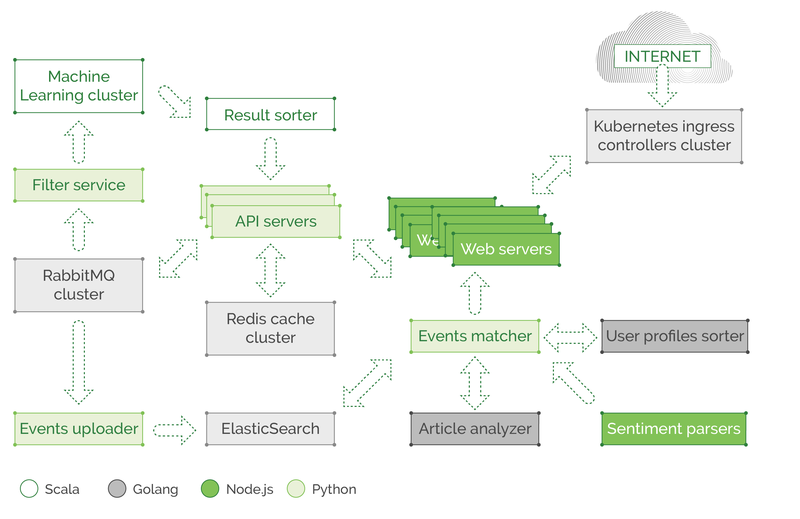 Service mesh a relatively new concept and – judging by the amount of available documentation, public discussion, and GitHub activity – it’s just beginning to be to adopted, following in the footsteps of containers and microservice based architectures. And it is just as beneficial. This article will help you understand the basics of service mesh, the infrastructure benefits of service mesh, and a hands-on tutorial so you can try it. The two main goals of a service mesh are to allow insight into previously invisible service communications layers and to gain full control of all microservices communication logic, like dynamic service discovery, load balancing, timeouts, fallbacks, retries, circuit breaking, distributed tracing, and security policy enforcement between services. The insights are provided by traffic audit and tracing features. Allow services to talk plain HTTP and not bother about HTTPS on the application layer: The service mesh proxies will manage HTTPS encapsulation on the sender side and TLS termination on the receiver side, allowing the application components to use plain HTTP or gRPC and any other protocol without bothering with encryption in transit. The encryption is taken care of by the proxies. Security policies enforcement: the proxy knows which services are allowed to access some other services and endpoints and will deny unauthorized traffic. Circuit breaking: automatic back off in case of accessing an overloaded service or endpoint, that has a high latency already, to avoid hitting it with more and more requests which may cause that endpoint to fail completely under an excessive load. Latency aware load balancing: instead of using a round-robin style of balancing (which ignores the latency of each target), use smarter balancing according to response times of each backend target. This is an incredibly important feature of a modern service mesh. Queue depth load balancing: route new requests based on the least busy target by current request processing amount. The service mesh knows exactly where it has sent all previous requests, and which of them are still processing or completed, so it will send new incoming requests based on that logic to a target with the lowest queue for processing. 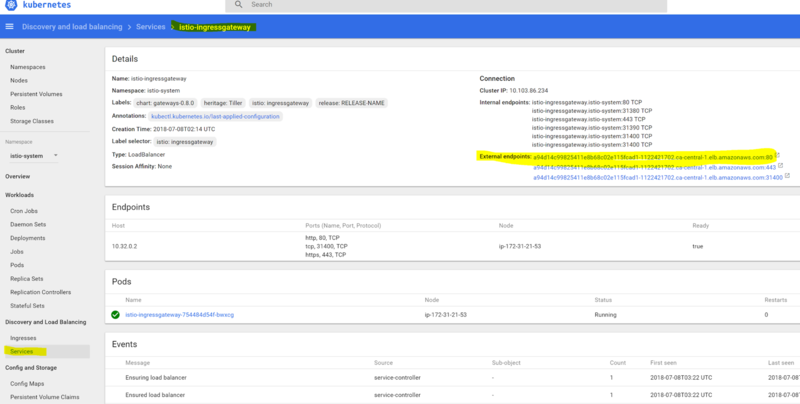 Per request routing: route particular requests marked by selected HTTP header to specific targets behind the load balancer, allowing easy canary deployment testing and other creative use cases. One of the most powerful features a service mesh provides. Health checks, retry budgets, and eviction of misbehaving targets. Metrics and tracing: reporting of requests volume per target, latency metrics, success and error rates. As a host shared proxy, a DaemonSet in Kubernetes terms. This type of deployment will use fewer resources if many containers exist on the same host and might also utilize connection pooling to improve throughput. But a failure in one proxy terminates the whole fleet of containers on that host, instead of breaking a single service (if it was used as a sidecar proxy). 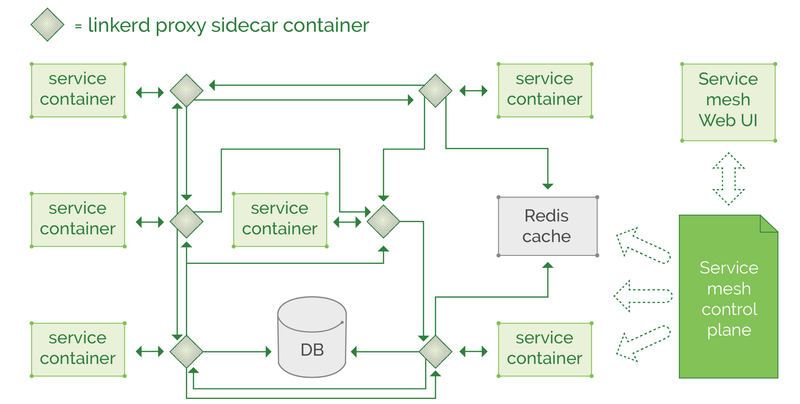 As a sidecar container, where the proxy is injected into each pod definition to run alongside the main service. In case of more “heavyweight” proxy like Linkerd, this deployment will cost you additional ~200MB of memory per pod. But if using the newer Conduit, will only cost ~10MB per pod. Conduit does not have yet all the features Linkerd has, so we’ve yet to see a final comparison of the two. Usually a “sidecar container per pod” is a good choice, limiting possible proxy failure to a single pod, and will not affect other pods on the same host. Why do you need to create a service mesh pattern? Let’s look at two diagrams of different types of application architectures to illustrate the need. The first example is an old-fashioned, three-layer web service that is written as a monolith all-in-one application. 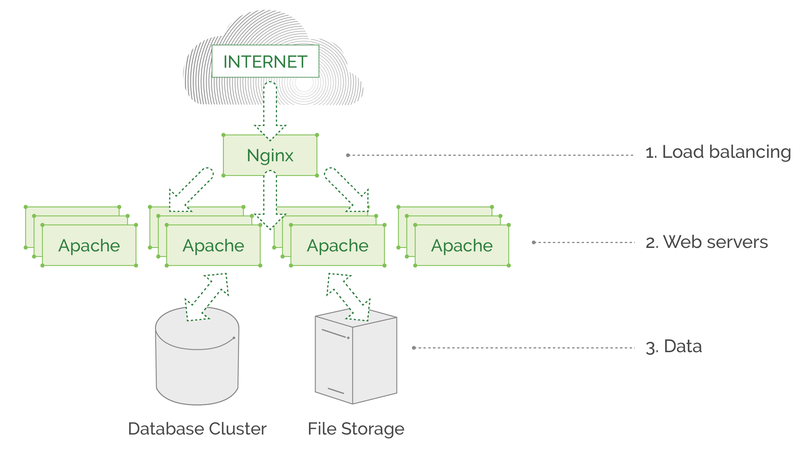 It may serve millions of requests daily, but has no complex features, and the communication of the underlying service is straightforward and simple: Nginx balances all traffic to Apache instances, which in turn fetch data from database\file storage and return the needed page. This example architecture will not benefit that much from a service mesh, as this monolith has no code written by developers that takes care of routing and communicating between application components because there are no microservices involved. In a monolith application, all core components are located on the same machine and do not communicate over the network, there are no REST APIs or gRPC. All “business logic” is within a single application, deployed as a whole piece on each Apache web server. The second example is a modern microservice based application with a lot of processes and behind the scenes logic. It does so many things, like learning visitor patterns and preferences to personalize their experience on the website, notifying users about their favorite topic updates, and so on. You can imagine the many complicated processes that happen between all these microservices, spread across thousands of containers and hundreds of nodes. Please note that our illustration is extremely simplified. In reality, we would lose count of the objects on screen if we were to display a real architecture of a large cloud-native application. In this example, we would have a piece of code in each microservice, that is related to communication. It sets the retry policies, timeouts, exception handling (in case of network failures), and the like. We also see a polyglot environment where teams created their component in Scala, some use Golang, Node.js or Python. All components can talk to each other through REST API or gRPC over the network, and each team spends time and effort implementing communication logic in their own component, using their respective language of choice, so they can’t share each other libraries and functions, to at least save time and use a unified solution plugged into all components of the application as a dependency. In addition to functions that query the service discovery mechanism (like Consul or ZooKeeper) or read some config passed externally to the application, there is a need to report latency and response-related metrics to Prometheus/InfluxDB. This includes information about cache response time (redis or memcached cache) which is usually located on another node or as a whole separate cluster, that might be overloaded and causing high latency. And all that is part of the service code and needs to be maintained in addition to the teams exploding backlog, and deadlines approaching. Developers hate to spend time on ops related parts of their code, like adding tracing and metrics (for ops to enjoy when troubleshooting and analyzing) or dealing with possible network failures, implementing fallbacks, and retry budgets. In this kind of environment, a service mesh will save development time, and allow a unified way to control the communication in a central fashion. So how do we change this communication layer mechanics to a unified “service mesh?” We take all of that microservice communication, routing, discovery, latency metrics, request tracing, and similar parts of microservice code, and move it outside the service completely, to form a standalone proxy process that knows how to handle all that (and much more) for each of the microservices. Luckily these tools already exist! Companies like Twitter, Lyft, and Netflix have open sourced their solutions, and other contributors also built their own tools on top of the open-sourced libraries. At the moment there are several major options to use as service mesh: Linkerd, Conduit, Istio, and Envoy. 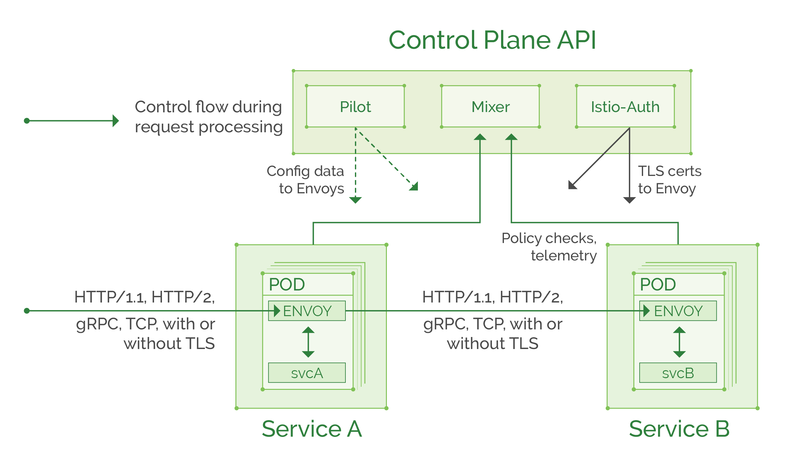 Istio is a component built on top of Envoy, it’s a control plane that can be used with both Envoy and Linkerd as its data plane proxies. The control plane allows a cluster operator to set particular settings in a centralized fashion, which will then be distributed across the data plane proxies and reconfigure them. Both Linkerd and Conduit are built by Buoyant, a team of ex-Twitter engineers. At the moment Linkerd is the most-used service mesh, but Conduit was built from scratch specifically for Kubernetes to be a lightweight proxy sidecar, that is extremely fast and ideal for Kubernetes environments. At the moment of writing, Conduit is still under active development. Let’s look at the change from application dependent communication logic, to “service mesh” pattern. The best thing to note is all those proxies can be configured and updated in the same place, through their control plane (or through configuration files in some repository, depends on the chosen tool and deployment method), and we can apply a particular set of rules on all thousands of proxies. So, the routing, balancing, metric collection, security policy enforcement, circuit breaking, data in transit encryption, all those actions will follow a strict set of rules, applied by the cluster administrators. Is Service Mesh Right for You? At first glance, this new concept of decoupling the microservice communication mechanics into separate architecture layer raises a question: Is it beneficial enough to be worth the complexity of configuring and maintaining a whole fleet of special proxies? 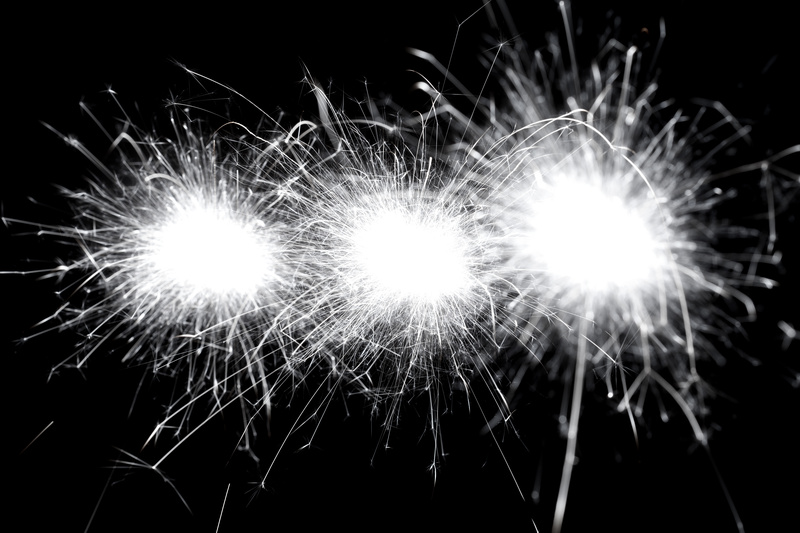 To answer that question, you’ll need to estimate the size and complexity of your application. If you have just a few microservices and data storage endpoints (for example one ElasticSearch cluster for logging, one Prometheus cluster for the metrics, with two or three databases for main application data) implementing a service mesh might be an overkill for your environment. 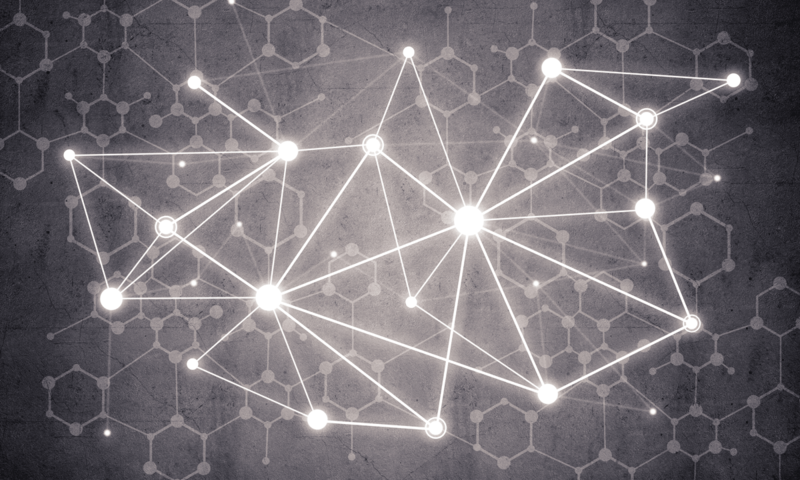 However, if you have your application components spread through hundreds or thousands of nodes, with 20+ microservices, your environment will benefit greatly from the features a service mesh provides. Even in a smaller environment if you prefer to decouple the retries and circuit breaking behavior from the application itself (from the code that manages reconnection and back off, for example, to avoid overloading other services or databases with retries) you can use the service mesh to remove this networking logic maintenance burden from your application developers, so they will focus more on the business logic instead of being involved in managing and tweaking intercommunication of all microservices. The ops team will configure the service mesh once, and tweak from time to time in a centralized fashion, minimizing the effort spent on application components communication. Istio is a perfect example of a full feature service mesh, it has several “master components” that manage all “data plane” proxies (those proxies can be Envoy or Linkerd but by default, it is Envoy so that’s what we’ll use in our tutorial while Linkerd integration is still a work in progress). Pilot: provides routing rules and service discovery information to the Envoy proxies. Mixer: collects telemetry from each Envoy proxy and enforces access control policies. Istio-Auth: provides “service to service” and “user to service” authentication and can convert unencrypted traffic to TLS based between services. Soon will be able to provide access audit information (work in progress). Envoy: feature rich proxy, that is being managed by control plane components. Intercepts traffic to and from the service and applies the needed routing and access policies following the rules set in the control plane. In the following tutorial, we will use the Istio service mesh to demonstrate one of the most powerful features: “Per request routing.” As noted earlier, it allows the routing of particular requests marked by selected HTTP header to specific targets that is possible only with a layer 7 proxy. No layer 4 load balancer or proxy can achieve that functionality. 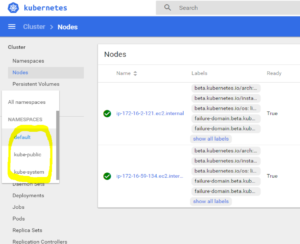 For this tutorial, we assume you have a Kubernetes cluster running (Hint: you can spin up a new cluster in a matter of minutes, following these instructions, or use “Kublr-in-a-box” to set up a local cluster in few easy steps). A small cluster with 1 master node and 2 worker nodes should be enough for this tutorial. There are about 50 events, you can scroll to see “successful” statuses, and will notice if there’s an error somewhere. In case of errors, you can post a bug report on Istio GitHub issues page, to point the developers to the issue. Note that when you want to use the Envoy sidecar with your pods, the label “app” should be present (it’s used in the request tracing feature), and “spec.ports.name” in service definition must be named properly (http, http2, grpc, redis, mongo) otherwise Envoy will act on that service traffic as if it was plain TCP, and you will not be able to use the layer 7 features with those services! Also, the pods must be targeted only by 1 “service” in the cluster. 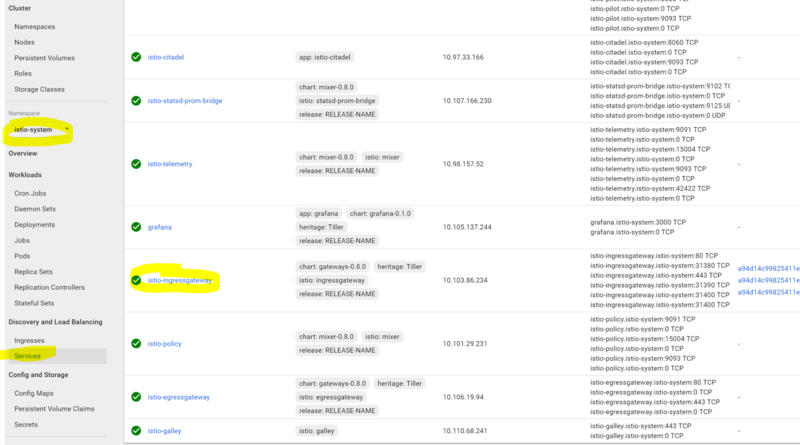 As you can see above, the definition file has three simple deployments each using a different version of the web service (v1/v2/v3), and three simple services, each pointing at the corresponding deployment. Let’s inspect the pods to see that the Envoy sidecar is present: kubectl get pods. Next step is to visit our demo website. 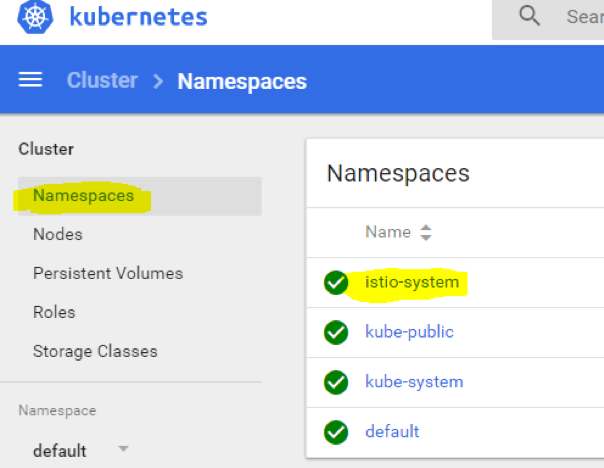 We deployed three “versions”, each shows different page text and color, but at the moment we can reach only version 1 through the Istio ingress. Let’s visit our endpoint just to be sure there is a web service deployed. Usually when new version of an application needs to be tested with a small amount of traffic (canary deployment), the vanilla Kubernetes approach would be to create a second deployment that uses a new Docker image but the same pod label, causing the “service” that sends traffic to this pod label, while also balancing between the newly plugged pods from the second deployment. It is not as flexible as an Istio solution. You cannot easily point 10% of traffic to the new deployment (in order to reach a precise 10% you will need to keep the pod replicas ratio between two deployments according to the needed percentage, like 9 “v1 pods” and 1 “v2 pod”, or 18 “v1 pods” and 2 “v2 pods”), and cannot use HTTP header for example to route requests to particular version. The source code for the article is available on github: https://github.com/kublr/istio-blog-sample. We hope this tutorial provided you with a good high-level overview of Istio, how it works, and how to leverage it for more sophisticated network routing. Istio streamlines implementation of scenarios that would otherwise require a lot more time and resources. It is a powerful technology anyone looking into service meshes should consider. In our next post, Hands-on Canary Deployments with Istio, we will use a custom HTTP header value to let Istio route our requests to correct versions of the web service. By doing that we will have full control of the traffic flow and will analyze the tracing results in Zipkin dashboard.